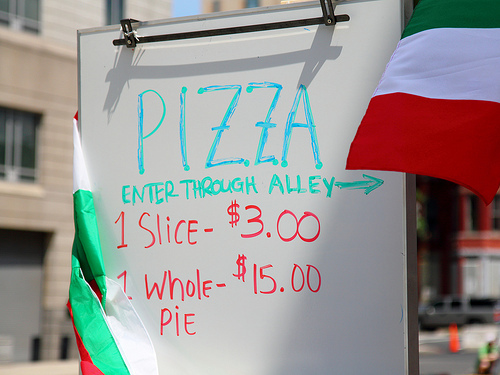 PoPville » Friday Question of the Day – Favorite Cheap Eats? We talk a lot about new restaurants opening up all over town. And it is almost guaranteed that someone brings up price. So I thought I’d focus this Friday Question of the Day on your favorite cheap eats. Let’s count cheap eats as something that costs $10 or less. It’s a tough decision for me but if I gotta make one selection I’m gonna go with a slice of mushroom pizza from Vace’s located at 3315 Connecticut Ave NW in Cleveland Park. Though a close second is anything savory, like the pizza or quiche, from the nearby Palena Market recently launched at 3529 Connecticut Ave, NW. So what do you guys say: What and where can you get your favorite cheap eats?